In the birthplace of of the refined ginjo style of sake, Miho Imada is carrying on a tradition of brewing beautifully fragrant and richly-flavored ginjo sake that are to be enjoyed as one of life's daily pleasures. At the end of the 19th century, in the small fishing village of Akitsu located on the northern shore of the Seto Inland Sea about sixty kilometers east of Hiroshima City, a creative and ambitious newcomer to sake-making by the name of Senzaburo Miura (1847-1908) ushered in the modern era of sake brewing and drinking with the development of ginjo style sake. Ginjo types of sake are characterized by their beautiful fragrances and complex flavor profiles. Best enjoyed chilled because of their refinement, they have come to be considered the quintessential sake by which connoisseurs judge the brew and first-time drinkers begin their romance with sake. The ginjo style resulted from Senzaburo’s efforts to make good-tasting sake from the soft water found in the streams and springs flowing from the mountains that cascade down to the coast around Akitsu. Until then, Japan’s best sake was produced from hard water because of its high concentration of minerals, which aid fermentation and contribute their own unique flavors. Senzaburo’s revolutionary method consisted of brewing sake at much lower temperatures and for longer periods of time than before. It also included creating a more robust koji rice starter to ensure a long vigorous fermentation. Key to his process is milling the rice—sake’s basic ingredient—so that it consists of more of its starchy, alcohol-producing center and less of its outer, protein-laden shell. Today, the guideline for a ginjo sake is sake made with rice that has been milled down to at least 60% of its original size. The guideline for a daiginjo sake, ginjo’s ultra-refined and super-premium off-spring, is sake made with rice polished down to 50% of its original size or below. Ginjo sake made Hiroshima prefecture one of Japan’s most important sake-producing regions. Many new sake breweries sprang up in the area, and their sake consistently won top awards at a national sake-tasting competition that was started in 1907. Using the book “A New Method of Brewing” by Senzaburo published in 1898, sake brewers across Japan began to copy these techniques, and the past 120 years of sake-brewing have been marked by their efforts to create ever-more refined ginjo sake using soft-water brewing methods, even where the water’s mineral content is not an issue. Rice milling, in particular, has reached extremes, and some currently leading brewers are making sake with rice milled down to a mere 22-23% of its original size. Such refined sake—irresistibly aromatic, luxuriously delicate, and intriguingly complex—have brought the ginjo style to a major turning point in its history. There is little room left to polish rice without turning sake into—for all practical purposes—umami-enriched, fermented water. In addition, a degree of uniformity of style and flavor has set in because ginjo sake brewers tend to use the same delicate rice hybrids and aromatic yeasts that were developed in the last century to make it. Furthermore, while making ginjo sake has always been a sophisticated, labor-intensive process, best done in small batches with lots of time and expertise, making super-refined varieties of ginjo sake requires a large, un-craftsmanlike (and for some brewers, uncomfortable and unsustainable) reliance on technology and specially-built equipment. Lastly, the precious tastes of many ginjo sake are best sipped and admired for themselves or enjoyed with delicacies like sashimi and foie gras, caviar and dainty salt pickles, and other culinary treasures. They are not the kind of sake that can be drunk steadily during an evening nor do they pair well with the richer, spicier, and meatier international foods that are increasingly being eaten in Japan. These conditions have inspired a new generation of brewers to experiment with the ingredients, processes, and qualities of ginjo sake, and they are making an exciting range of more natural, versatile, and distinctly-flavored types that are redefining what it means to be a premium sake. A leader among the new generation of ginjo sake makers is Miho Imada, who is making very high quality, hand-crafted ginjo sake, literally in Senzaburo’s front yard. Imada Shuzo, her family’s beautiful old sake brewery, is located just below Senzaburo’s former home in Akitsu. The business was started by her great-grandfather in 1868, and it was his neighbor Senzaburo who gave Imada Shuzo’s sake its brand name of “Fukucho,” or “Forever Fortune.” The name was surely a testimonial to the quality and flavor of Imada Shuzo’s sake even back then. It was probably also an encouragement to, in Senzaburo’s words, “always experiment and constantly innovate” to make sake that keeps up with the times and ensures a prosperous business. That is what Miho has been doing ever since she gave up her job in Tokyo over twenty years ago to move back to Akitsu and take over the family business. Because of her success Imada Shuzo is one of only three sake breweries left in Akitsu out of seventeen that operated there during the last century. Solemnly overlooking the village of Akitsu, Senzaburo Miura's former house on the right is perched on the top of a series of ishizumi stone terraces that are planted with citrus trees and bordered by a narrow mountain stream. Directly below is Imada Shuzo , which is distinguished by its red brick chimney. Akitsu's spring water was fabled for miracles long before it was brewed for sake. This spring located down the road from Imada Shuzo, known as Shoin no Kiyo-Mizu, is said to never run dry and was also famous in ancient times for its ability to help stave off dragons. Miho Imada inside the formal entrance to the sake brewery. The blue cloth banner hanging to her left is printed with her sake's brand name and logo of "Fukucho," which means "Forever Fortune." From the courtyard of Imada Shuzo, Senzaburo Miura's former home seems to be part of the brewery complex. 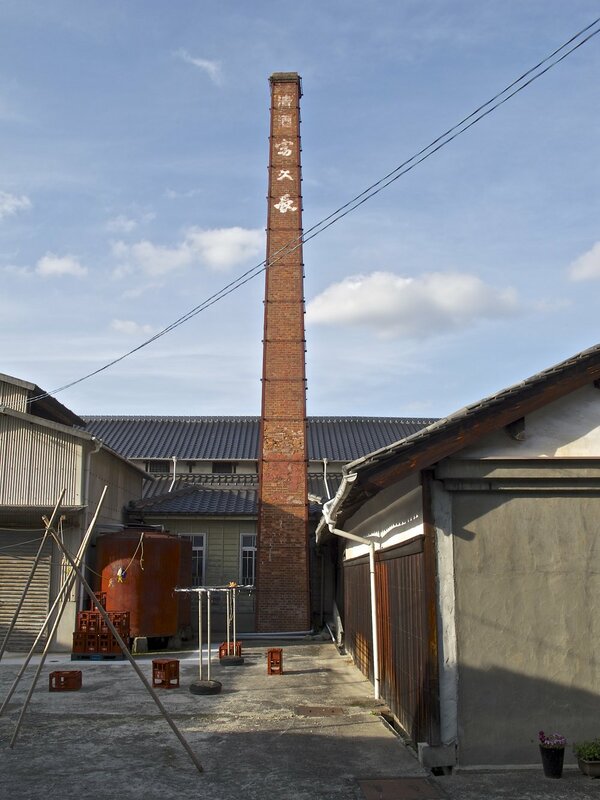 Imada Shuzo's red brick chimney is typical of sake breweries built in the Meiji era (1868-1912). Miho is well-known in the sake world for being a woman in a male-dominated industry. Even more exceptional, in an Akitsu tradition established by Senzaburo, she is both kuramoto brewery owner and toji master brewer, which means she does everything: sets the vision for the sake, leads the team making it, and runs the business. (Elsewhere in Japan, the roles are usually handled by two different individuals.) People who have met her also know she is creative, passionate, hard-working, and kind, and seemingly always in good spirits (no pun intended). Even during the busiest winter months Miho will take time to greet you and explain what she does. Miho’s vision is straight-forward: make a high quality, great-tasting Hiroshima jizake, or regional sake, that reflects the “terroir” of the region and goes well with its cuisine. For Miho this means making sake as naturally and fresh as possible using the best local ingredients. It also means making sake that best expresses the qualities of the ginjo style: enticing aromatics and rich umami flavor. A major project of hers during the past decade has been working with local farmers to revive Hiroshima’s original sake-making rice called Hattan-so. It had not been grown and used to make sake for over a hundred years, being replaced by a number of hybrids known as Hattan-nishiki, which are lighter in taste and also higher-yielding. Hattan-so, which Miho now uses in half of the sake she makes, is a lower-yielding, long-stalk type of rice that has much more of the delicate, sweet, creamy flavor that the Hattan varieties of rice are known for. Miho draws the nuances of the rice’s flavor out by applying traditional soft water brewing methods. She does not focus on milling rice to create complex flavor, and tends to limit milling rates in order to retain as much of the rice's natural flavor as possible. Instead, she relies on an exceptionally long and slow fermentation to create the solid floral fragrances and soft deep flavors that are characteristic of her sake. To support this kind of fermentation, Miho makes a strong, natural koji rice starter. Her koji-making process is a unique one developed locally for ginjo sake. First, the rice used to make the koji is milled slightly more than the rice that will be added later to be brewed as the mash. Next, the koji is mixed by hand with wooden paddles for over fifty hours in the kimoto method that was used in Senzaburo’s day but with the added twist of being spiked with natural bacteria to increase its fermenting power. Miho is often featured in documentaries like the one being filmed here by NHK, Japan's public broadcasting station, about innovative artisanal food makers in the Seto Inland Sea area. She was also in the 2018 documentary film "Kampai! Sake Sisters." Imada Shuzo is a small brewery even by artisanal standards, and produces only 60,000 1.8-liter bottles of sake a year. It is one of the very few sake breweries in Japan that specializes in making ginjo types of sake, and it has acquired a great deal of skill and experience in its 150-year history. As is traditional, sake is only made in the cold winter months from October to the end of April, when Miho and four other staff begin each day at 6:30 a.m. by steaming rice to make the koji rice starter and the brewing mash called moromi. This and every step of the ensuing process is done in small batches, by hand, with a great deal of care and attention to detail to ensure quality and flavor. Once the sake is brewed, the team focuses on keeping the sake as naturally-flavored as possible and also on preserving its aroma and deep flavor. After the sake is pressed from the fermented mash it is not charcoal filtered. It is muroka, or unfiltered sake. In addition, distilled alcohol is not added to temper the sake, and all of Imada Shuzo’s sake is junmai, which means pure. In the winter months, the sake is available in unpasteurized, or nama, versions. Finally, the sake is put straight into bottles and allowed to age there rather than being stored in large tanks to be bottled later. Some sake is pasteurized because it will be sold and consumed in the summer or will be exported. To limit any deterioration in flavor this might cause, the bottles are set for a brief three minutes in water that has been heated to sixty-five degrees, then quickly showered with cold water. This particularly helps the sake keep its beautiful aroma, which in Japan is considered an essential quality of the flavor of all good food and drink. Miho calls this machine "my lovely steamer" because it is used daily and plays such an important part in the sake-making process. The fermentation room where the sake acquires its nuanced character over the long cold winter months. At Imada Shuzo a tankful of freshly-brewed sake glows with a naturally iridescent green color. The color dissipates when viewed in smaller quantities but is still visible if you look closely at a glass of Fukucho sake. Imada Shuzo is a very focused brewery, and makes just eight different varieties of sake. The heirloom Hattan-so rice that is used to make half of them is milled in a comparatively narrow band of down to as little as 75% of its original size to no more than 45%, creating sake that all have the same soft, deep rice flavor but with different intensities of aroma, body, and complexity. The rest of the sake are made with other varieties of high quality, locally grown rice. All of Imada Shuzo’s sake is made using the same methods, even the ones that are produced with rice milled to over 60% of its original size and which do not technically qualify as ginjo types. At Imada Shuzo, ginjo is defined by the brewing process and the qualities of the finished product, not by the milling rates of the rice, and all have an attractive combination of luxuriant aroma and rich umami flavor. Compared to traditional Hiroshima sake, which tends to be full-bodied and sweet, Miho brews hers to be lighter, slightly drier, and more refreshing. These qualities make Imada Shuzo's more drinkable and easier to pair with a wide range of food. They are also excellent to cook with. The sake is a perfect match for the fresh, natural, umami-rich cooking of the region, which is undergoing a rebirth due to the creativity of its chefs and the many foreign ingredients and tastes they are incorporating into their dishes. The cuisine of the western half of the Seto Inland Sea is among the oldest in Japan. With its roots in Japan's native Pacific Island food culture, it is composed mainly of seafood, fresh foods, and primal seasonings like salt and citrus and a cooking style that is simple but which has evolved over time to create dishes that are natural and balanced yet soft, rich, and often slightly sweet in flavor. This reflects the gentle yet full flavors of many local foodstuffs due to the region's mild climate and excellent growing conditions. For example, seafood specialties are oysters and octopus; even the region’s famous lemons and seaweed salt are mild and slightly sweet. It also reflects a belief in the goodness of life. Local cooks tend to add a bit of sugar to most dishes to ensure they are rounded, if not a little sweet, and sake is heavily used as a cooking medium because of its umami-richness and the soft flavors it helps to create. Foreign foods that offer a subtle richness like olive oil and cheese are also increasingly being made locally and layered into the ingredient-oriented way of cooking. 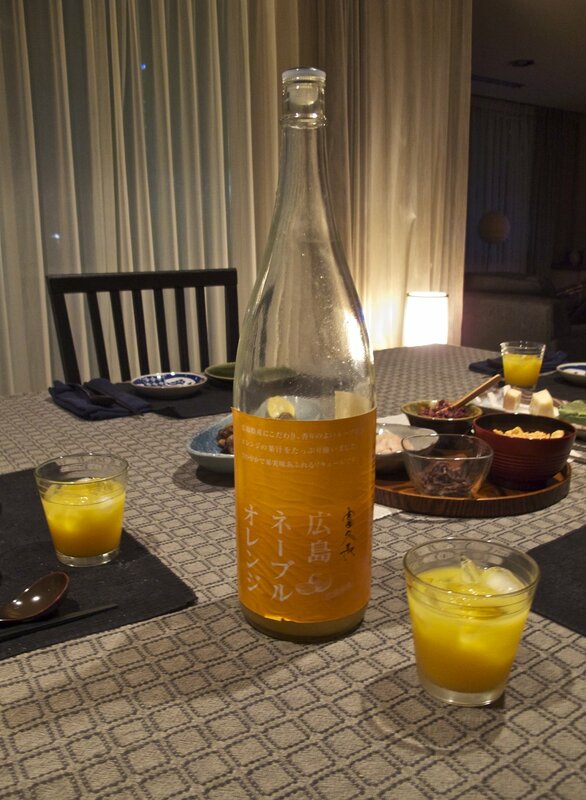 The all-natural citric acidity of Imada Shuzo's "Hiroshima Navel Orange" sake makes it a healthy and refreshingly delicious drink that stimulates the appetite. Miho brews two sake especially to pair with local seafood. One, called “Seafood Sake,” is a medium-bodied sake with a light acidity. Another is a brighter, sparkling sake called “Seafood Sparkling” to be enjoyed with rich seafood like oysters. It is one of two sparkling sake she brews to extend the range of sake's ability to fit with modern lifestyles. Miho also makes two types of citrus-based sake: a lemon sake that mixes the pulp of Hiroshima lemons with sake and a navel orange sake that uses locally-grown, sweet-sour oranges. Both are refreshingly delicious and dangerously easy-to-drink. They can be enjoyed as aperitifs, summer afternoon pick-me-ups, or brunch cocktails. Imada Shuzo markets its sake under two different brand names. In Japan it is known as “Fukucho.” Abroad it is also called “Moon on the Water.” Miho is an active ambassador for her sake as well as the industry in general, and by traveling abroad regularly to participate in conferences, tastings, and collaborative food events, she has built up an impressive network of distributors, as well as fans. Of the six sake highlighted below, five are available in a number of countries outside of Japan. Made with Hiiroshima's heirloom rice Hattan-so milled lightly to 75% of its original size, this straight-forward junmai provides the purest taste of this delicately creamy rice combined with the characteristic tartness of a junmai and pleasant fragrance and deep flavor gained from Imada Shuzo's extra long brewing process. It is a very drinkable sake that goes particularly well with all kinds of foods. A junmai ginjo sake using Hattan-so rice milled to 55%, this sake best represents Imada Shuzo's vision and style and is opulently delicious. It is luxuriantly fragrant and combines soft, rich, full-bodied flavor with a clean, refreshing finish. Not surprisingly, this sake has won awards both at home and abroad. It is a perfect match for the fresh, natural, and subtly rich cuisine of the region and with similar cuisines like French Mediterranean, Italian, Middle Eastern, Cantonese, Vietnamese, and contemporary farm-to-table cooking in North America and Australia. Only available in Japan, this is the most refined sake that Imada Shuzo makes. Also known as "Miyokafu," it is a masterful balance of the natural flavors of Hattan-so rice and Miho's skills as a brewer. The rice is polished only to a modest 45% of its original size, and after its full delicate flavor has been enhanced and transformed during brewing, the mash is hung in bags and allowed to slowly drip (shizuku means "to drip") for three hours (instead of being pressed) to capture its purest drops. In Japanese, the word used to describe this sake is "nameraka," which means smooth. A better word for this soft and complex sake is silky. It is usually available only for a short time in the winter (unpasteurized) because it is a limited edition that sells out quickly. This sake is Miho's nod to classic ginjo sake and made to showcase her style and talents as a brewer. It is made with Yamada-nishiki rice, a highly aromatic and soft-tasting rice, which is considered by many to be the best sake-making rice. It is also probably the most widely used rice by brewers across the country to make ginjo and daiginjo sakes. Polishing the rice only to 55% of its original size, Miho makes it sing with an intense floral fragrance and soft lush flavor. It is a wonderful sake for sipping or enjoyed with light first-course appetizers like sashimi. Known as "Biho," this junmai ginjo sake is a mix of the light, fruity rice hybrids Yamada-nishiki and Hattan-nishiki milled to 55%. It is a lively, elegant sake with a fruity aroma and gentle, lingering richness tempered by a crisp tartness. This sake is great with spicy food and meat dishes. This is a sweet, bright fizzy junmai sake made with local Hiroshima rice polished to 70%, designed to be a satisfying aperitif or accompaniment to heartier seafoods like oysters and other rich fresh foods. The sake's own richness and acidity are heightened by being nigori, which means that it has been pressed through coarse cloth allowing some of the sake lees to remain in the brew. Outside of Japan this sake is called "Fukucho Seaside Junmai Sparkling Sake." Sake for sale at the entrance to the Imada Shuzo brewery. 今田酒造本店 Imada Sake Brewery Co., Ltd.
Imada Shuzo is open from 8:30 to 17:00 every day except Sunday and national holidays. Sake is available for purchase at the entrance; just call out and someone will come to take care of you. Chances are it will be owner-brewer Miho Imada who will gladly help you make your choice (she is fluent in English) and also arrange for the sake to be shipped to your final destination, if that is your preference. Miho Imada and her assistants can often be found in the packing room to the right of the entrance to the brewery. Imada Shuzo's sakes are available at most well-stocked sake shops across Japan as well as in the liquor sections of the department stores in the country's major cities. 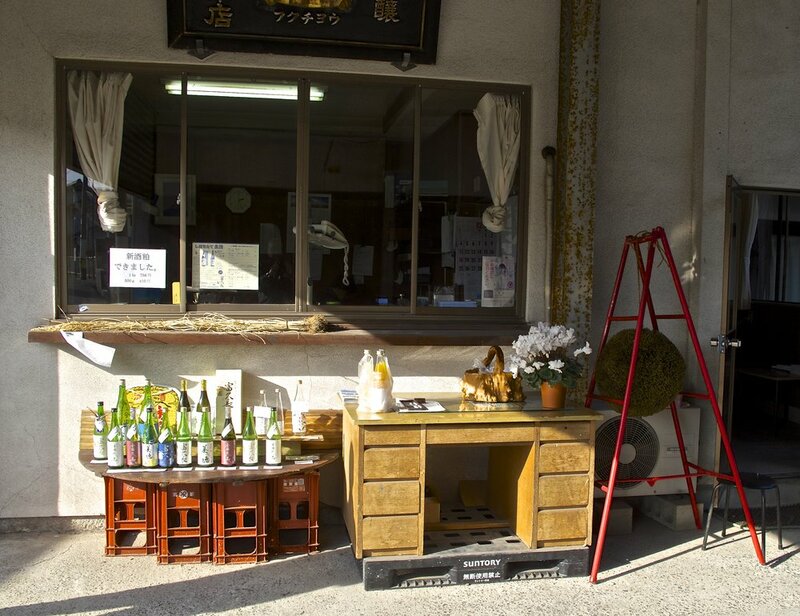 If you are traveling in the Akitsu area, an excellent place to stop is the Maekawa Liquor Shop located in a corner of Fuji-san Supermarket in the town of Takehara. The shop has a full range of Hiroshima sake, including many specialty and limited edition sakes. The manager and kikisake-shi, or sake sommelier, Noritsugu Yamada is very knowledgeable and happy to teach you about Hiroshima's sake, including giving you free tastings. The shop also carries sake from elsewhere in Japan. Noritsugu Yamada, manager and sake sommelier of the Maekawa Liquor Shop in Takehara. Getting There: "The Hiroshima Sake Road"
Hiroshima prefecture is one of Japan's top sake- producing regions, and there are a number of old, family-run breweries making distinctive types of sake in the area's country towns and villages. Many of these artisanal breweries are located along the coastline of the Seto Inland Sea and can easily be reached by JR West's local Kure Line train, including Imada Shuzo in Akitsu. Some of the breweries are open to the public, providing an opportunity to taste and buy their products and also get a glimpse into their extraordinary residence-factory compounds, which were largely built in the Edo (1603-1868) and Meiji (1868-1912) eras. The Kure Line runs from the city of Mihara in the east (which is a convenient stop on JR West's Sanyo Shinkansen bullet train) to Hiroshima City's Kaitaichi Station in the west. It is a picturesque journey along the coast. From Kaitaichi Station you can continue your sake journey by taking a 28-minute ride inland on JR West's local Sanyo Line to Saijo, which is the center of sake-making in Hiroshima prefecture. Following is a short list of some of the breweries accessible by the local Kure and Sanyo Lines as well as suggestions of places to eat along the way. 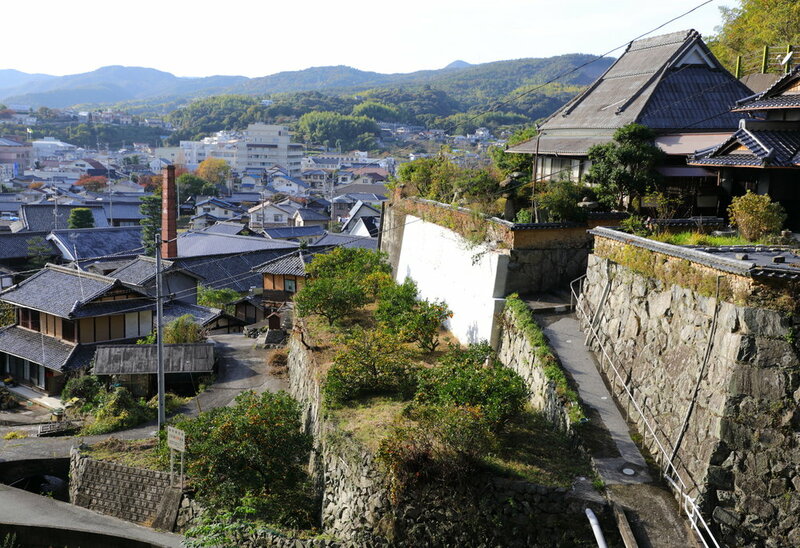 Mihara has a long history as a castle town first for the Kobayakawa clan that ruled western Japan during Japan's medieval era and later for the feudal lords of Hiroshima in the Edo period. The castle is long gone, and today Mihara is a modern city serving its local area. However, the historic district along the city's old main street, which lies conveniently just behind the train station, is being revived and has some interesting temples, old businesses, and new restaurants. One of these establishments is Suishin, a sake brewery that was started in 1860 and became an early winner several times over of the top award at Japan's national sake-tasting competition. It has long been famous for the sake it brews from the extremely soft water it collects from the base of Mt. Takanosu, about two hours north of the city in the mountains in the center of Hiroshima prefecture. Suishin's sakes have classical Hiroshima flavor profiles—strong aromas, rich, slightly sweet, full flavors, and thick, lingering after-tastes. Suishin is also known for the discovery of sake yeast #3 in 1914. Out of use for many years because of its strong acidity, Suishin created a limited edition of sake with it this winter called "No. 3," as the brewery begins to experiment with new styles of sake to meet modern tastes. There is a tasting room just inside the entrance of the building. Staff are likely to be rushing about, but are happy to stop and help you. If you begin asking a lot of questions, they may even bring out the company president, Yuuichi Yamane, who is the 5th generation owner and brewer, to help answer them. On the same side of the street as Suishin, in an historic old merchant building a few blocks walk west, is Yogansu, a restaurant run by Hiroaki Takato that specializes in delicious hand-made, wood-fired oven pizzas featuring seasonal, local ingredients. It also serves similarly fresh and creative salads and pastas. The boldly austere architecture of Suishin is characteristic of Mihara's old main street. Yogansu's white pizza is topped with shirasu (whitebait) from the Seto Inland Sea, local seasonal vegetables, and parmesan cheese. Once a major sea salt-making center, Takehara is a modest-sized market town with a well-preserved historic district filled with old merchant residence-warehouses and also galleries, craft shops, and restaurants. Three famous sake breweries continue to operate in the town. The two that are centrally located in the historic district, Taketsuru Shuzo established in 1733 and Fujii Shuzo established in 1863, are open to the public. One of Fujii's sake brands, ”Ryusei," won first place in the first National Refined Sake Competition held in 1907. The third sake maker, Nakao Jozo, is located on the outskirts of the city center and is not open to the public. It was established in 1871 and produces the "Seikyo" brand of sake. There are many good places to eat in Takehara. Two that stand out are Il Traghetto in the historic district, which is run by Kaoru Shinzaki, who gives fresh, local ingredients like seafood and vegetables "an Italian taste," as he says, and Nishino Farmhouse Restaurant, a home-style cooking place that is located in an old farm building on the road leading from Takehara to Akitsu. The ancient early Edo era buildings of Taketsuru Shuzo. The more modern Meiji era buildings of Fujii Shuzo. Some of the seafood and vegetables dishes set out on the large buffet served every weekend at Nishino Farmhouse Restaurant. Kure is a large town because it was once a headquarters for the Imperial Japanese Navy and more recently because of the many adjacent municipalities that have been merged into the city. Among the sake breweries that exist in the city's boundaries, one of the most interesting is Enoki Shuzo, a small, family-run sake maker that is located about a 45-minute bus or taxi ride from Kure's center to the town of Ondo on Kurahashi Island. Founded in 1899, Enoki Shuzo makes a very rare kind of sake called kijo-shu based on a technique it developed of adding sake, as well as water, to brew a new tank of sake. It is basically double-brewed and highly-concentrated sake. The eight and ten year-aged varieties that Enoki sells under the "Hanahato" label are considered by some the finest grade of sake because of their very rich, sweet, and velvety flavors and dark amber-color. The brewery is open during the Golden Week holidays in early May every year and can also be visited by appointment. Saijo is the sake-brewing capital of Hiroshima prefecture, and there are eight breweries conveniently lining Sakuraga-dori Street, which is just off of the train station. The breweries are a combination of large commercial and small artisanal businesses, and all are fun to visit because of their educational exhibits about sake-making, tasting rooms, and beautifully-preserved architecture. Every year in mid-October Saijo holds a “Sake Matsuri” festival. It is a big and not-to-be-missed event for sake lovers because you can taste over 1,000 different varieties of sake from all over Japan. Saijo is also full of interesting shops and restaurants. The restaurant "France-ya," which is sponsored by Kamotsuru, one of Hiroshima and Japan's largest and most well-known sake breweries, serves perfectly-prepared Japanese and Western food at very reasonable prices. The specialty of the Japanese restaurant, which is on the second floor of the building, is bisho-nabe, a hot pot of pork and vegetables stewed in a broth made only of sake and sea salt. It is the kind of simple yet rich, full-flavored, and immensely satisfying cooking that is typical of the region. Similarly, in the Western restaurant downstairs, the featured dish is Taoshita wagyu beef cheek, which is braised for hours in both red wine and sake because the sake's umami balances the wine's acidity, giving the dish a soft, deliciously rich finish. The spaces are small, so do not expect to get in without a reservation. Inside the Kamotsuru sake brewery compound there is an excellent visitor center. The Japanese restaurant on the second floor of France-ya. France-ya's lunch set of bisho-nabe hot pot (top left) includes a raw egg for dipping the stewed pork and vegetables plus an assortment of local sashimi raw fish and lightly-prepared seasonal vegetables (top right) and miso soup, rice, and pickles (bottom right).